How to draw Lara Croft from Tomb Raider. How to draw comics or game character Lara Croft from Tomb Raider. Learn to draw comics, Lara Croft Tomb Raider reboot. 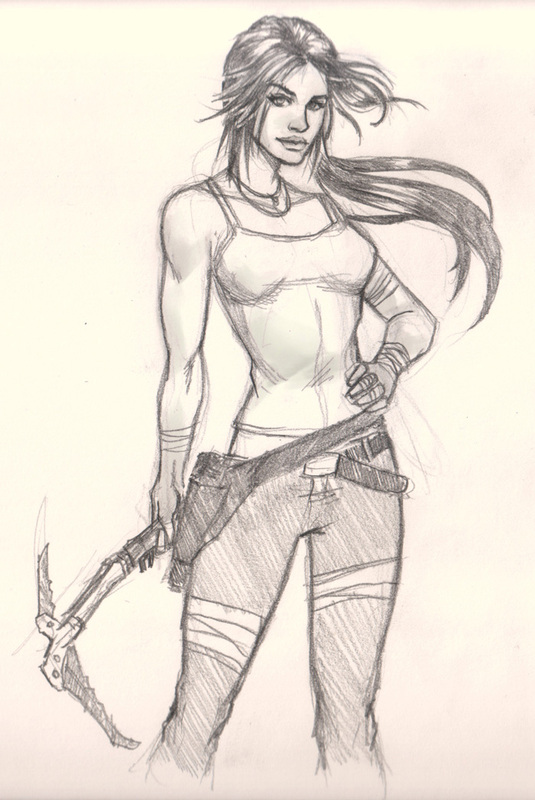 Draw and Sketch comics character, woman girl female Lara Croft pencil drawing. Learn from Step by step and video tutorial. Drawing and sketching step by step: female character design for manga, video game, and comics basic. The process shows BASIC drawing and sketching video series of comic book characters that will help you gain knowledge of anatomy and dynamics in the positioning of the figure and the details. Lara Croft is a fictional character and the protagonist of the Square Enix (previously Eidos Interactive) video game series Tomb Raider. She is presented as a beautiful, intelligent, and athletic archaeologist-adventurer who ventures into ancient, hazardous tombs and ruins around the world. Here is a final drawing of Lara Croft from Tomb Raider. Watch drawing video instruction how to draw Lara Croft from Tomb Raider. Below are step by step images how to draw Lara Croft from Tomb Raider along with the video instruction. Step one, I draw her upper body then her hip before I place her head onto the body. Tips, go for the biggest shape of the subject first, it is easier to measure against the small smaller part. If you are drawing mostly body and head, then body first. Step two, I then emphasis on her posture and stance, notice over all posture look like an “S” curve from head to the bottom of the drawing. Step three, then I went in and refine head shape and drew her long flow down hair. Step four, after I have all the body anatomy in place on the construction drawing (light line drawing) then I will draw over with darker and more refine line as see in figure 5. Watch the video lesson above for more in depth and detail instruction. http://adriana2010.deviantart.com/art/Lara-Croft-Crossroads-324827615 ! Thank you for the tutorial! I love your work i’m but 13 of age and am currently working on a si-fi comic your tuts really help ,keep going!! !